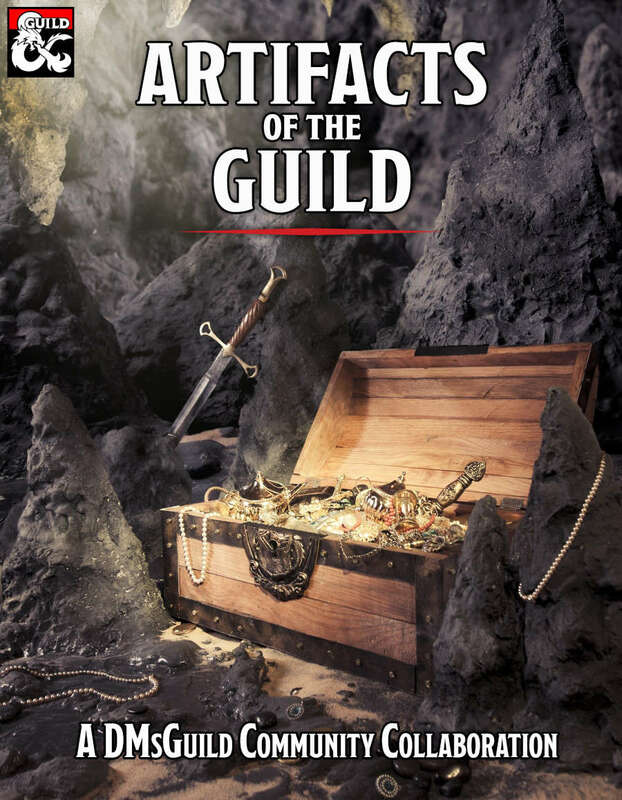 Written by 58 of the Guild's most talented and exciting creators, this book instantly provides you with more heroic magic items, suitable to fill a treasure chest of any size. From a sunken shipwreck to a dragon’s hoard, these items will fit perfectly into any fantasy campaign. Coming soon! Available as print-on-demand! This project will soon be available in print-on-demand. If you purchase this item prior to the print edition being made available, you will receive a discount code on the future print release. IMPORTANT! 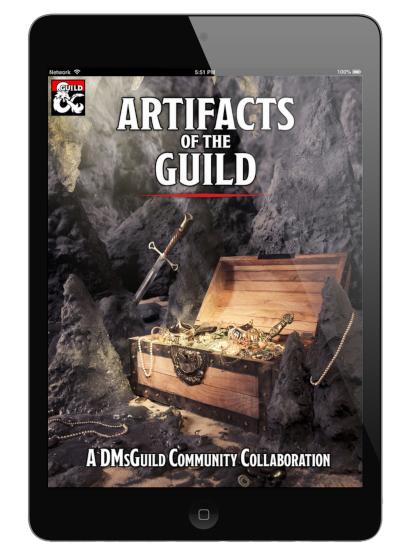 You must opt in to email from DMs Guild to recieve your discount code. This can be adjusted in your account preferences. 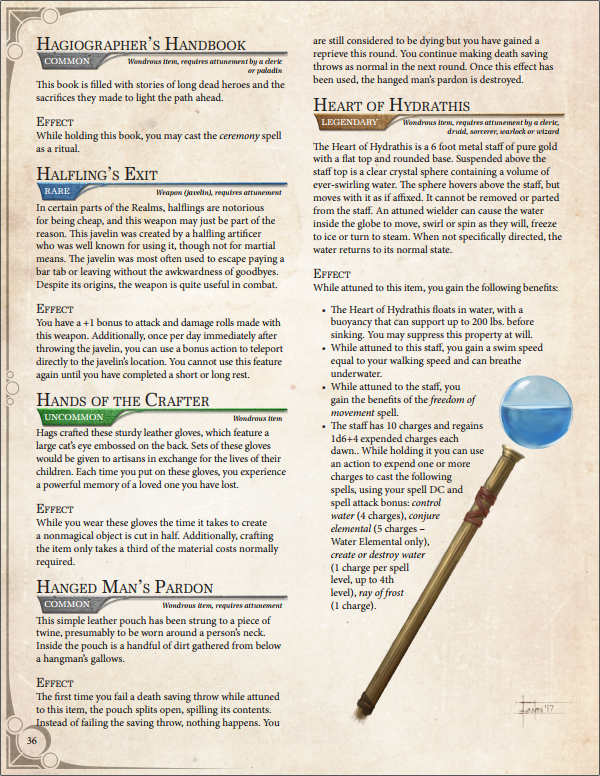 Havent read all of it yet, but so far it's great and I'm glad to add more magic items to my campaigns!! One balance "issue" I have is the Elemental Fists and the Elemental Touched Mesh. 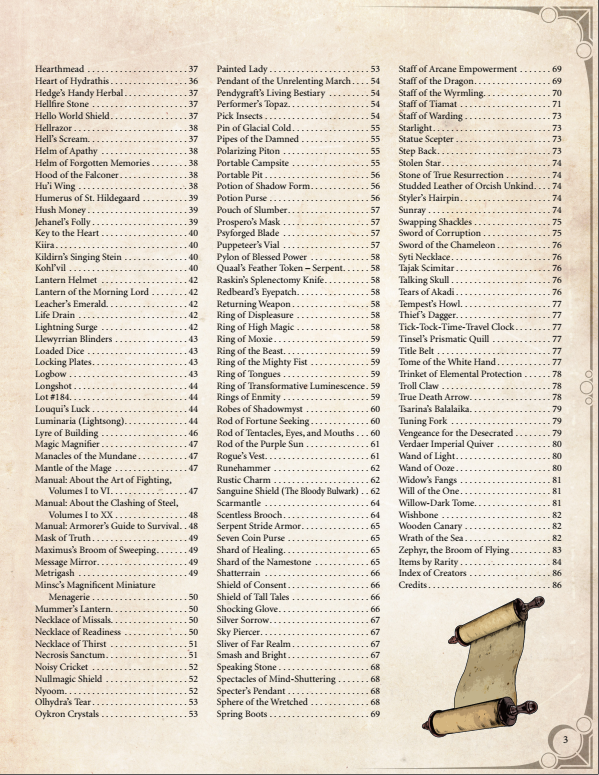 Fists are rare, require attunement, and they add 1d4 only on unarmed strikes and they also require a bonus action. 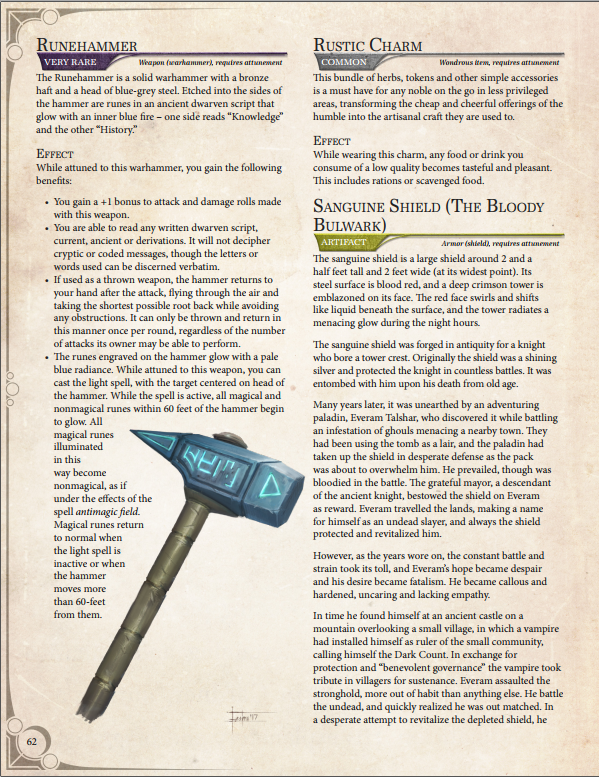 While the Mesh is uncommon, no attunement, and 1d6 that can used with 1 handed weapons and unarmed strikes(possibly 2 handed? Since that hand is holding the 2 handed) and no action required. Not sure what is the best route to change that but I think some kind of change is needed. Hi Connor, thank you for your feedback. We will review these two items for consistency, and make any necessary changes in a future update. I've read through it and I've found a few more things that probably have a balance "issue" with regarding rarity, attunement, etc. Do you want me to post them here or is there a preferred method of giving you feedback. 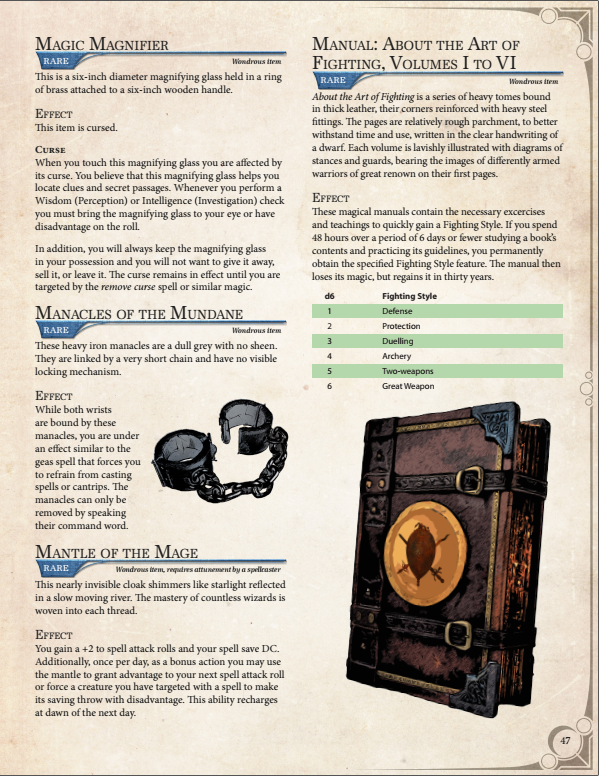 I only ask just in case writing about the magic items in the comments is an issue, the feed back would be the same style as my one in the previous comment, except some of them I would have some recommended changes/thoughts. Hi Connor, we would really appreciate any feedback you have. 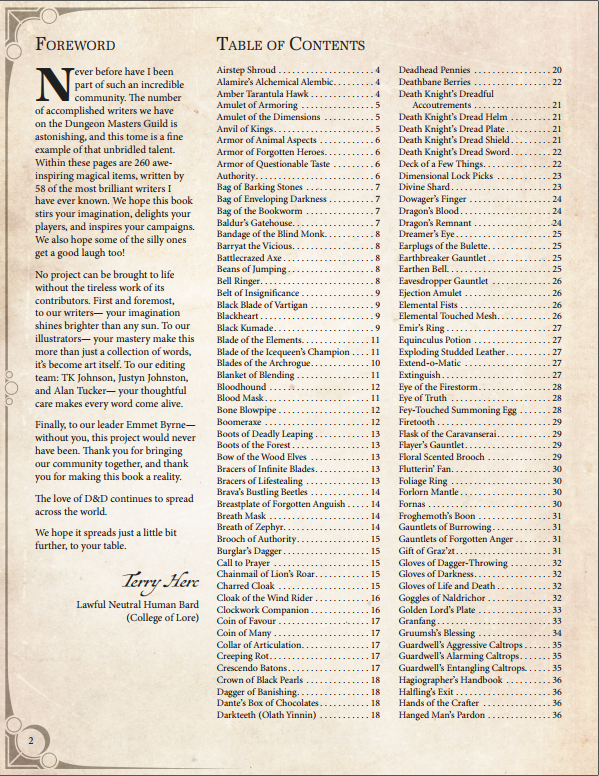 If you feel it's too much to put in a comment here, please send an email to terryherctomes@gmail.com and the team can review any potential changes. Tajak Scimitar: very rare and attunement by a spellcaster, only +1 weapon and a wand of magic missles, both of those items are uncommon and can be used by anyone and dont require attunement, at best this is a rare item no attunement or uncommon attunement, it definitely needs more to be considered very rare. Tears of Akadi: I don't think attunement makes sense in terms of how it's supposed to be used? I believe you give it to a beast and they can talk but the PC's are practically always humanoids so just like a 1 time use rare item no attunement. Tempest Howl: only rare and attunement, but it's a flametongue which is already a rare + attunement on it's own, then it's also a +2 and give resistance to a damage type AND advantage to resist being knocked prone. This item is practically legendary level. to nerf it make...See more it like 1d4 lightning damage or change the +2, or just make it legendary is what I would think of. Amber Tarantula Hawk: Maybe the DC to 11 to avoid the stun? I feel like the chance to stun is really really strong. 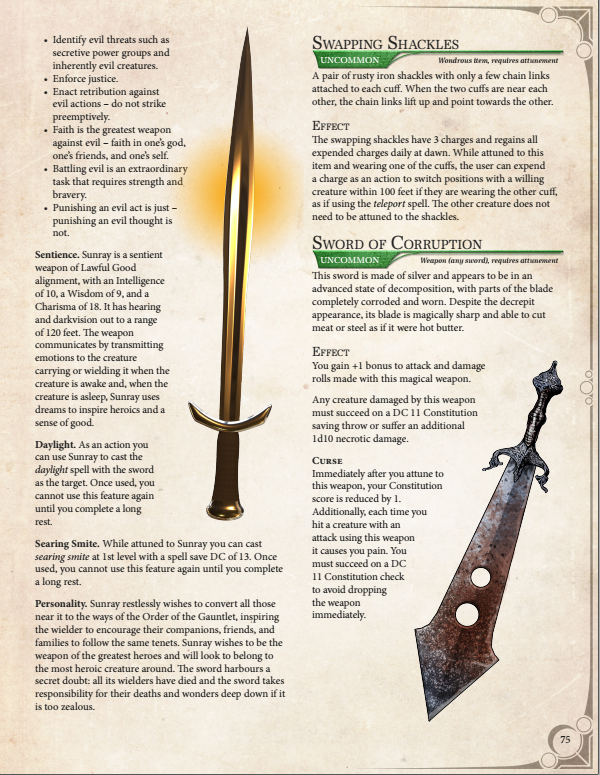 Anvil of kings: maybe no attunement? I don't see you carrying this around and once you leave the item for more than 24 hours then you are no longer attunement, it's a cool item but the attunement is kinda unpractical? not sure. I'll add a few more when I get some more time. Hi. Once downloaded are you able to print this at home? Hi Naomi, for sure, you can print this at home if you'd like. We will also have a print-on-demand edition available in the future, and anyone who purchases the PDF will get a discount on a purchase of the print edition. Is there a reason it's impossible to use the full set of the Death Knight's Dreadful Accouterments? With 4 items all requiring attunement, it would seem the Death Knights themselves wouldn't be fully equipped. Hi Carter, that appears to have been a little transpositional error - the Dread Helm does not require attunement. The aim with this set is that a character or NPC would be able to wear (or seek) the complete set. We will adjust this part of the text in an upcoming update. Thanks for calling it out. Cool makes sense. Thanks for the quick reply. Really loving these items so far! That's great to hear Carter, thank you for sharing. We are so thrilled with all the positive feedback we have been receiving! I am also having the item not found issue when trying to download. Hi Bobby, we apologize for the inconvenience. We have asked the DMs Guild team to look into this technical issue. Please try your download again in a few hours. Everything is working perfectly now! That’s great Bobby, thanks for confirming! For some reason this won't download... Says that the date wasn't found... Feeling like this is either a scam it there is a big network issue. File size listed as 0. What the F? Hi Alan, my understanding is that there is a technical glitch that is affecting file downloads for some users. My understanding is that the DMs Guild team is working through the matter. Please try your download again in a few hours. 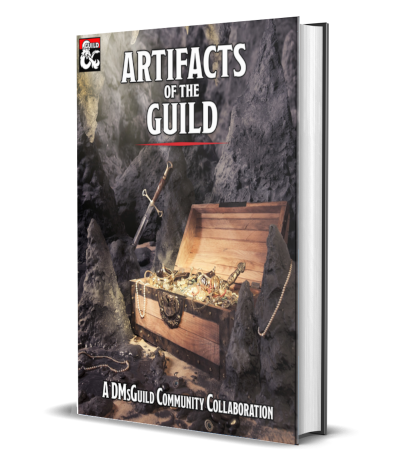 If you continue to have challenges, the DMs Guild support team can assist further. Does this contain random treasure tables? Hi Travis, there is an index of items by rarity. With a little modification this could be used as a random treasure table.